Twenty-four Christmas markets in seven cities in seven days. My ambitious goal had the potential for exhaustion and bankruptcy. But with the contagious spirit of Hochgefühl and goodwill toward men that kept me energized and a bit of monetary self-restraint, I avoided both pitfalls and enjoyed the most wonderful time of the year like never before. 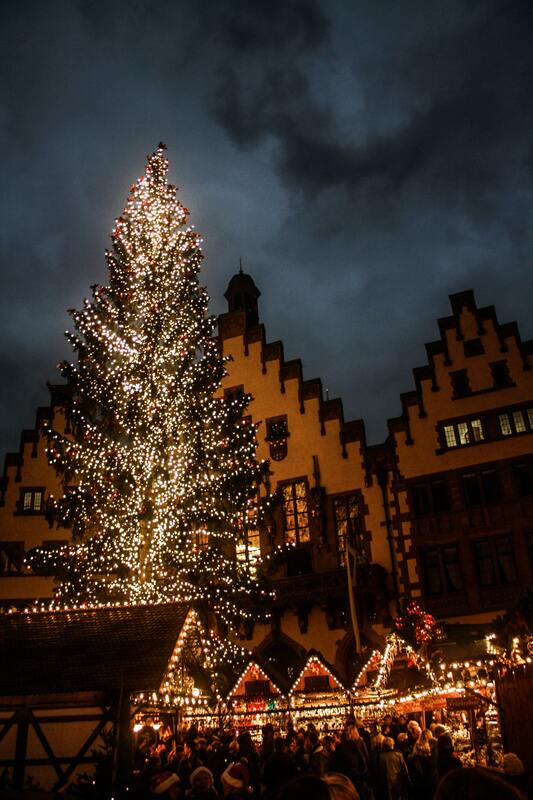 With their romantic backdrops, like this one in Frankfurt, German Christmas markets are incomparable. After settling into my hotel, the superior Steigenberger Metropolitan, I stepped out into the brisk air at the start of a week of fluctuating sun and clouds and temperatures in the 40s and 50s — perfect for hours of outdoor browsing, purchasing, eating, and drinking, and for absorbing the holiday atmosphere that seemed to pervade the entire country. The main train station across the street from my hotel couldn’t have been more convenient for my plans. Every day, I would join the nearly half a million people riding on the trains on its 26 tracks, making this station the busiest hauptbahnhof in the country. Opened in 1888, the handsome structure, topped with a statue of Atlas, would mark the beginning and end of my day — except today. Instead, I was spending my first day right here, in Germany’s fifth-largest city. I made my way to the Main River, which lends itself to the city’s nickname, Mainhattan (a clever bit of paronomasia on the city’s skyscrapers and banking industry in a nod to New York). I stopped at the Städel Museum to admire its collection of some very fine Dutch and religious art before crossing the Main and pausing to see the old opera house, one of the most beautiful in Europe, meticulously rebuilt 101 years after it originally opened following its near destruction during World War II. After the city’s old town — the largest Gothic town in Central Europe — was devastated by bombings in the war, not much remained, and the current lack of abundant centuries-old architecture one expects in European old towns served as a profoundly sad reminder of mankind’s barbarism. 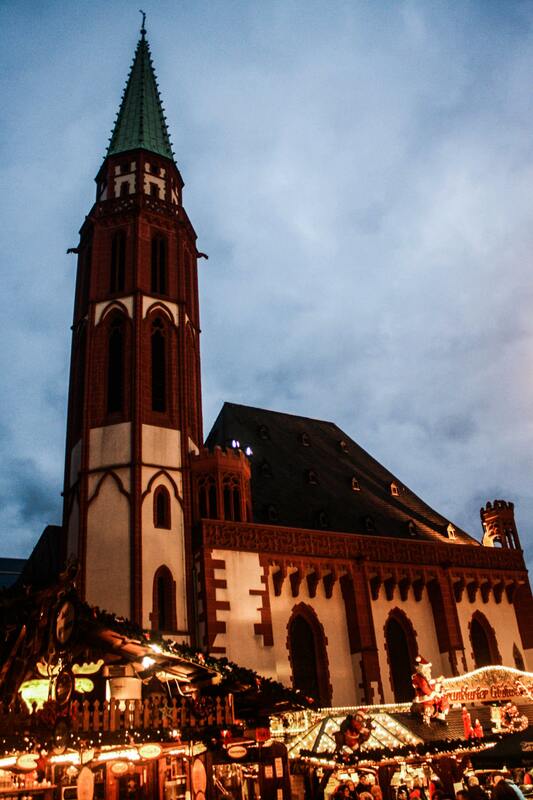 In the Römerberg platz, gabled buildings and a soaring Christmas tree tower over the illuminated market. But Christmas is all about birth and joy and the promise of a new beginning, and my spirits quickly lifted as I approached the first market, in the square next to Paulskirche (St. Paul’s Church), which was destroyed during the war and was the first building in the city to be rebuilt. Official documentation first refers to the Frankfurt Christmas market back in 1393, and I was thrilled to be participating in a tradition that spans more than six centuries. Dusk had fallen, and cheerful lights illuminated the chalet-like stalls and trimmed their rooflines. Throngs of people of all ages from Germany and around the world meshed into one happy mass, excited by the rapidly approaching holiday and all the good tidings it encompasses. I started to admire not just the quality goods being sold at the stalls — hats, gloves, jewelry, Christmas ornaments, hand-crafted wood products, and more — but the elaborate decorations of the stalls themselves. Some were topped with simple glowing snowmen or Santa Clauses, others with white stars or reindeer. Some elevated the ornamentation to works of art: one with a full roof with an attic window and a chimney from which Old Saint Nick emerged; another populated by angels; another with gift-wrapped boxes in yellow lights and a sled in blue lights pulled by one reindeer, with a single telltale red light on its nose. I crossed the street, merging into the crowds at the second and larger market, in the Römerberg platz. Holiday songs and the scents of German street food wafted in the air. One particular booth lured me to it with its giant circular grill swinging over an open flame and crammed with dozens of different types of sausages. I purchased a bratwurst with mustard and meandered down the lanes, inspecting the hand-knit scarves and leather wallets and colorful translucent glass candleholders, and stopping at the Nativity scene, always placed at a prominent place in every market I would attend. 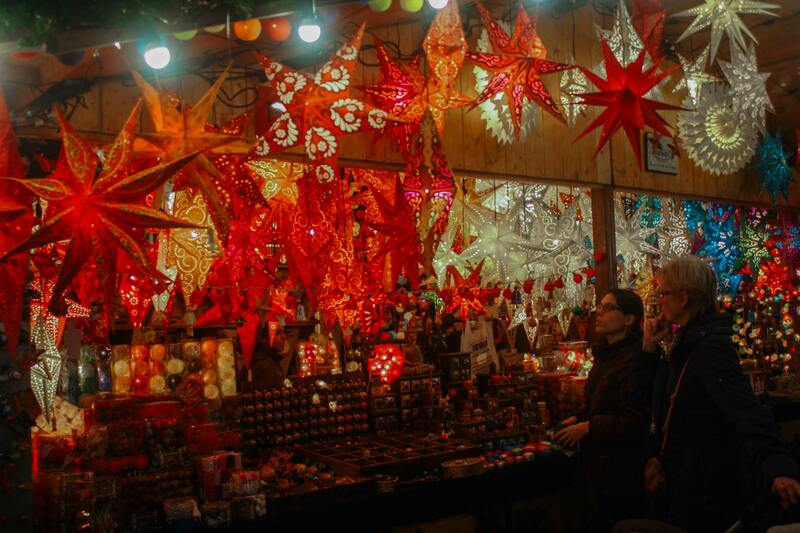 Get starry-eyed as you stroll among the festive stalls. Half-timbered buildings on one side of the square faced the older gable-fronted buildings, including the city hall, on the other. Between them, the 15th-century Alte Nikolaikirche (Old St. Nicholas Church), which escaped the war largely unscathed, grabbed attention when a brass band emerged at its roof and played “O Tannenbaum.” Appropriately enough, I was standing under the giant Christmas tree that towered above me, listening to their performance while watching gleeful children as they spun around on the carousel and snacking on a messy crêpe stuffed with bananas, Nutella, and eggnog liqueur. Completely enveloped by the Christmas mood, I wrapped up the evening with a stroll under the old Seufzerbrücke (“Bridge of Sighs”) to the smaller, more intimate Main Quay Market along the river. Enthralled by it all, this was more than I imagined it would be, totally surpassing my expectations. And I sensed it would only get better with the trips I had planned, starting with tomorrow’s jaunt to Nuremberg.